Closing out week 2 of the whole resolution thing, I thought I’d throw in a quick 2 minute mindmap. 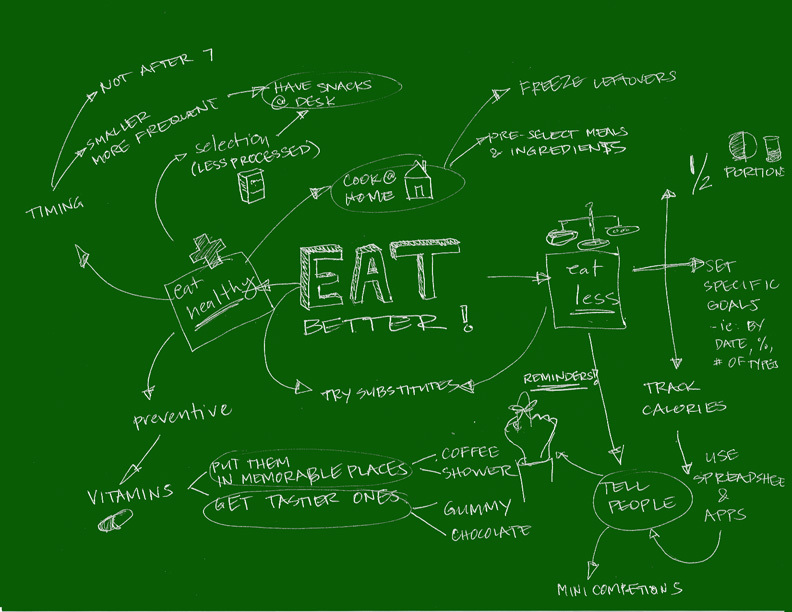 One of my resolutions is about working more with my hands, as I wrote about for Charlotte Viewpoint, but this mindmap is a simple brain dump on another related resolution: to eat better. Creating this helped me realize that I should put my vitamins in a place that’s easy for me to remember to take them. 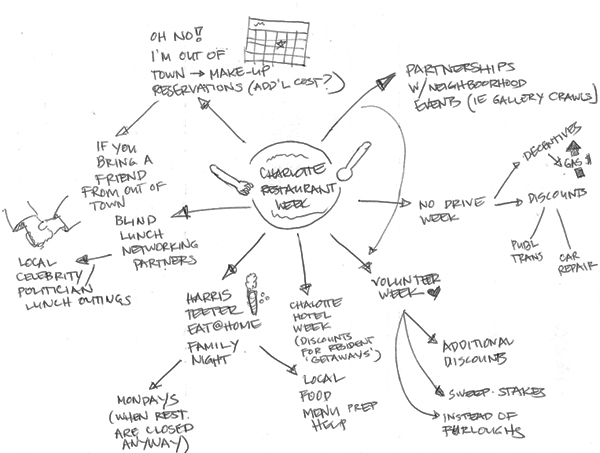 It’s been a while since I posted a mindmap, and although this doesn’t really count as one, I did take a little coffee break today and documented it. 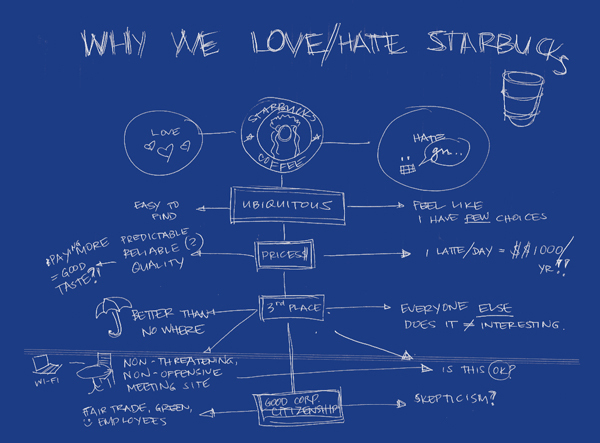 Starbucks is one of those places we all love to hate, yet hate to admit we love. 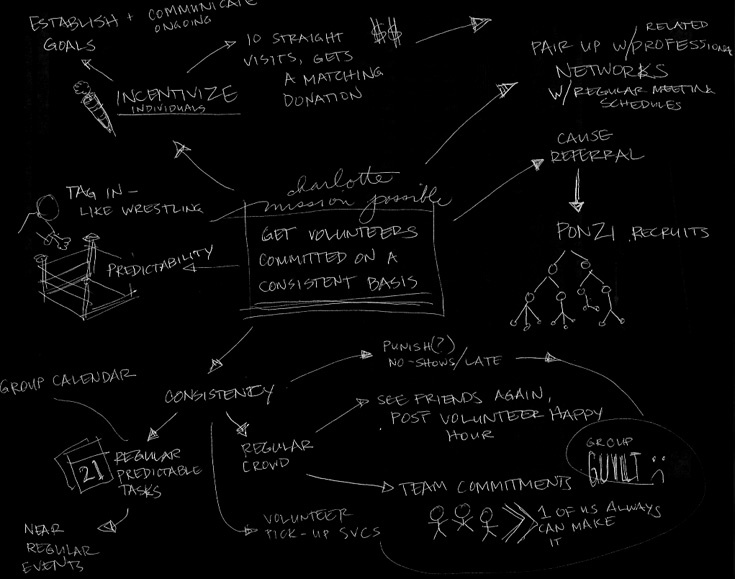 I just realized I missed the deadline for entries after I got around to creating a mindmap for the Mission Possible project, so I guess I’ll post it here. Maybe there’s a nugget of an idea in there somewhere for the folks who didn’t procrastinate like I unfortunately did. In my original conversation with Steve Gunn, we talked about how framing a problem in a specific way makes it easier to solve. In this case, a smaller, yet very real problem in the area of charitable needs is not actually getting more volunteers, but rather, how might we get them to commit their time consistently? I’m just now catching up on some back podcasts on Business Week, and I caught a curious phrase from an cover story from a few weeks ago that I hadn’t heard in a while: Consumption Smoothing. It’s a strategy rooted in retirement planning, where you try to balance saving and spending behaviors over a lifetime so that when retirement comes, you can enjoy a lifestyle that’s on par with what you’ve averaged over the majority of your working years. 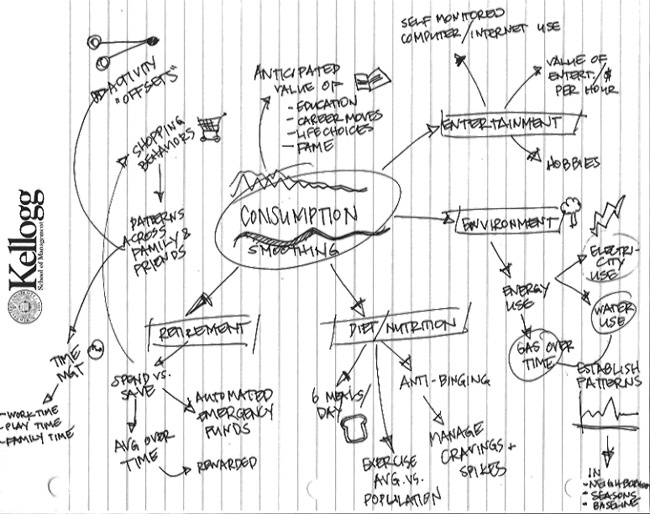 In the spirit of the 2 minute mindmap, I played with the notion of how this concept could apply in lots of different places that we consume. As a relatively new homeowner, I’ve spent some time thinking about the personal economics of renting vs. buying. Yesterday, during one of our weekly pilgrimages to Home Depot or Lowes, we were in the market for a 20′ ladder, but not so much the $250 price tag. I briefly considered alternative solutions, including renting. 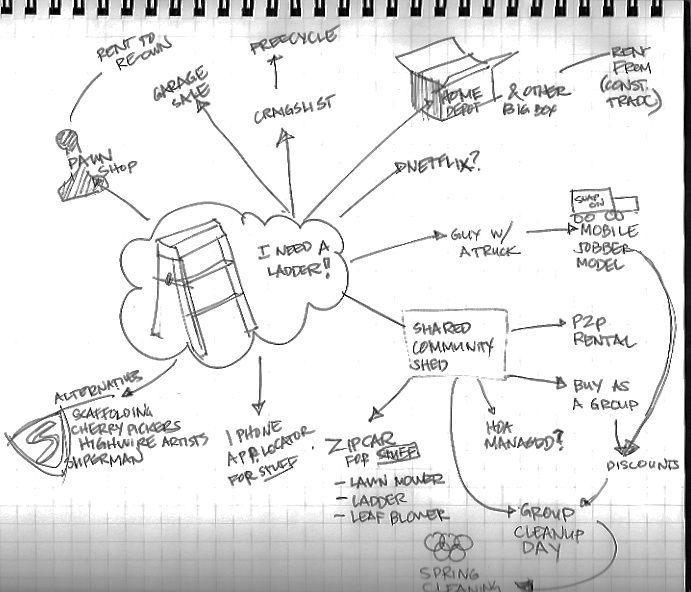 Here’s a Monday 2-Minute-Mindmap capturing the mental scan at the time. Lots of companies may be having a go at the rental business model, especially in a tough economy. My favorite idea from this: a neighborhoood Spring Cleaning Olympics! You have unique needs when you attend a lot of weddings. What can you build a product or service around? A name change service for new brides makes a nice shower gift. Hire guests if you don’t have enough friends and want to impress others. An intentional area for professional photos where the bride & groom can also greet each guest. Purchase photos like you would at a cruise instead of favors. Dancing lessons for the guests at the rehearsal dinner.